I thought I had escaped, but something keeps drawing me back. I am a baby boomer, born and raised in the small country community of Hattonsville in Portsmouth, Virginia. The third of eight children, we lived in a shotgun house with six rooms and no indoor plumbing. For me to find a quiet space where I could draw and create was a premium. After graduating from I.C. Norcom High School, studying art at Pratt Institute in NY and ultimately receiving a BA in Fine Arts from Norfolk State College … I thought I had escaped. A commission in the US Army, a tour of duty in Germany — “it” drew me back. I found myself at Norfolk State University where I earned a degree in education, taught high school and then became Artist-in-Residence for the Norfolk Public School System … but I was drawn away again. Thirty years later I would retire from a Risk Manager position with Ford Motor Company. Through all of those years I continued to draw, paint and create. My parents told me it was something I did from the time I first picked up a pencil. I thought everybody did, and they all seemed to be better at it than I was, so I worked harder at it. Mother-dear passed away suddenly from a stroke in 1966 at the age of 42. Daddy-O passed away in 2005. It was through him that I first learned about this thing called Dementia and Alzheimer’s. It took a while before we realized what was going on as we witnessed his memory loss, vehicle incidents, changes in temperament and his increased dependence on help with basic needs. He had worked in the Naval Ship Yard for over thirty years so when we saw him (during moments of mental clarity) sit up, struggle to get air into those asbestos-exposed lungs and then say, “whew – boy oh boy” as he held his head in his hands, helplessly we knew that he was hurting. Uncle Raymond — the brother of my mother — and Cookie had no children. Through 64 years of marriage theirs was the place and they were the couple in whose presence everyone wanted to be. To know them was to love them for they were non-judgmental and he especially was a kind of “wise man.” When they asked me, in the mid 90’s, if I would look out for them when they got older, without hesitation, I said ,”yes.” Their youthful spirits lead me to feel that they would never grow old. I did not know that such a commitment would come to be defined as “Caregiver.” So we did the Powers of Attorney, the Living Wills and Advanced Directives. I was added to their bank account, and Uncle Raymond carefully explained to me what he felt I needed to know about their Veterans Administration, Social Security and disability benefits, should they need to be activated. We even took care of final rights arrangements. These conversations caused my heart to pound inside my chest as the more he explained, the more complicated everything seemed. I questioned whether I would be up to the task. Add to that the 650 miles between Kentucky where I live and Virginia, and the challenges continue to add up. For Uncle Raymond, it became apparent that he was changing in 2007. There were more trips to the hospital, lost keys and credit cards, disorientation and confusion, more and larger dings and dents to his car, and an admission to Cookie (his wife) that he was, “losing it.” Because he would not listen to any discussion from me about decreasing his driving, I pulled their family physician to the side during a routine checkup and expressed my concern. Convinced, the doctor told him he should no longer drive. A couple of days later Uncle Raymond had a fall while in the bathroom that lead to a 5 day stay in the hospital. On the day he was discharged (one in which I will never forget) I sat down with him and Cookie in their living room and had “the Talk.” They did not know that during earlier trips to Virginia I had been visiting assisted living and nursing home facilities in search of a suitable place for them, should it come to such a decision. I told them that I could not return to Kentucky, leaving them in their home, knowing what I knew. They agreed and a couple of days later were transferred to an assisted living facility. The goal isn’t to live forever; it is to create something that will. And so, my father had it, my uncle had it and it is in the family genes. I thought I had escaped. I told my brothers and sisters, my son and grandkids about the possibility that one or more of us may someday be affected by Alzheimer’s. With all that modern medicine knows today, our best course of action is to prepare, and to keep a close eye on each other. I heard somewhere that creativity is the spontaneous release of emotions through any number of venues. When I see people living their lives … when I am around family, I work to be aware, and I try to recreate those experiences to form a specific moment in time. When completed, a story is told. When I combine my art with the possibility of the “long good-bye” that is Alzheimer’s, I am reminded of the quote; “the goal isn’t to live forever; it is to create something that will.” And so, you see … I can never escape. 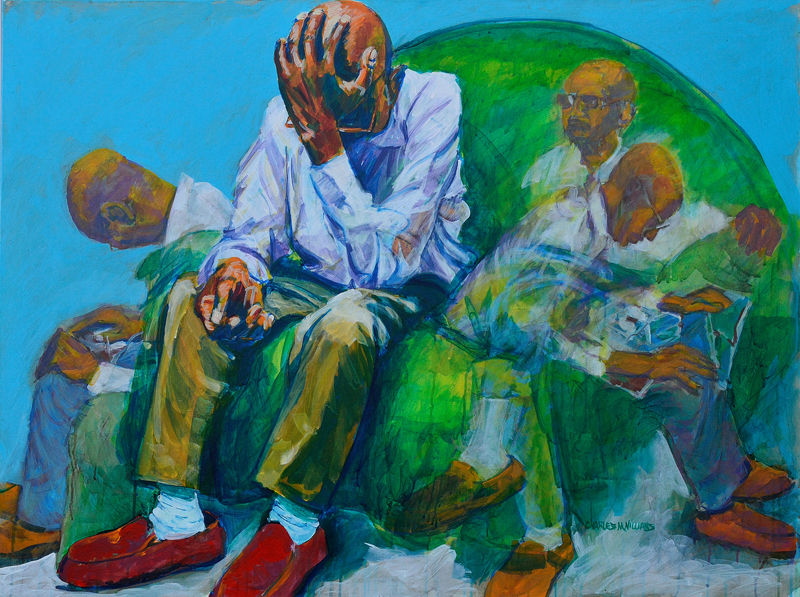 USE 2B SO EZ - ALZHEIMER’S GREEN CHAIR 36” x 48” During the last days of my father's struggle with Alzheimer's, the Green Chair was his favorite place to sit when he was "aware." It seemed to represents the universal place in which victims of this terrible disease find themselves. It is in this comfort zone where they settle into peace and remembering. 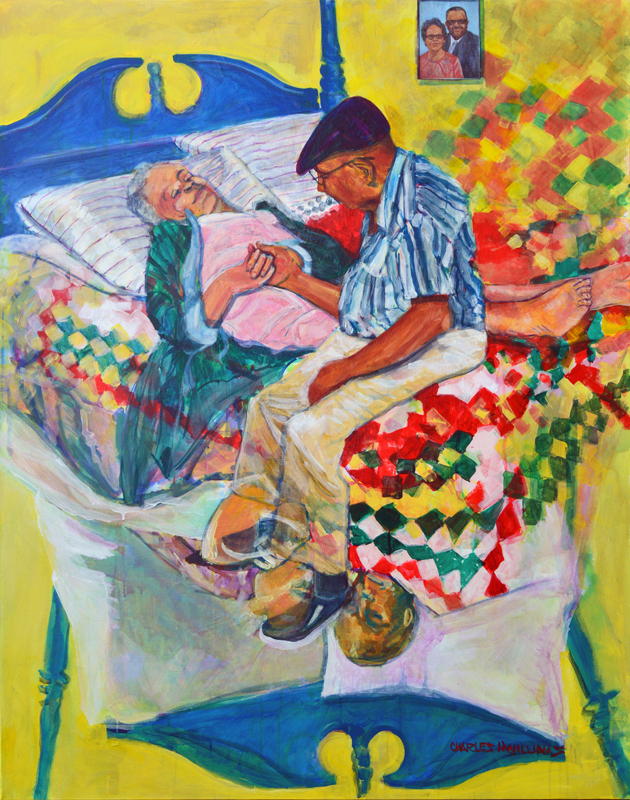 "N SICKNESS AND N HEALTH" 60”x48” After my mother and father, my uncle and aunt have been the most influential and encouraging people in my life. Time and circumstances placed them into an assisted living facility and later, into a nursing home. Their love for each other has never wavered. Upon returning from an overnight stay at the hospital, my aunt laid down on the bed, exhausted. My uncle, during a moment of clarity from the Alzheimer’s, realized that she had returned. He had missed her. As the medical transport team walked out of the room, he walked over, sat on the bed where they held hands...and they smiled at each other. Alas, they were together again, "N Sickness and N Health." "USE 2B SO EZ – HELP ME UNDERSTAND" 48” x 36” Does anyone really know what's going on in this age, time, and space continuum that we call life? My uncle stood up and possibly did not feel the tugging of age and dementia. When I saw this image of a child (in another setting) they were destined to be together in a painting where their thoughts meet and ask to, "Help me understand." 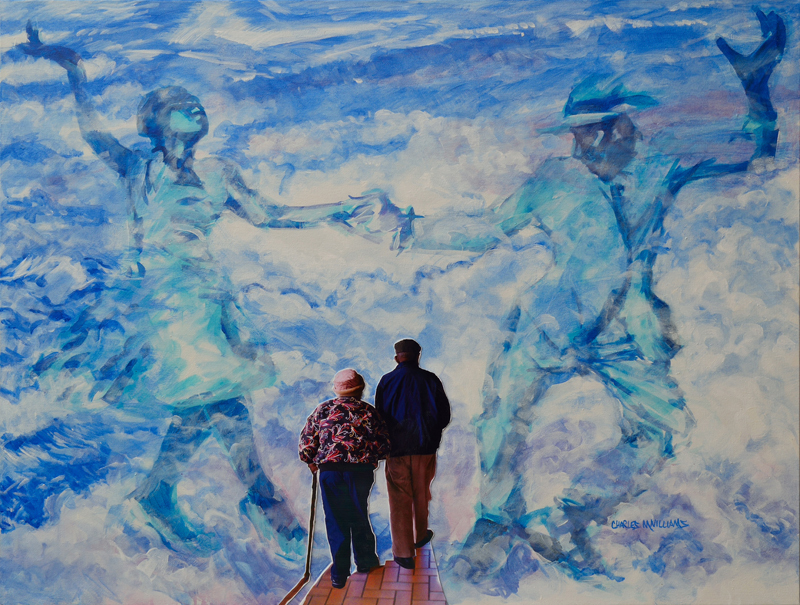 "USE 2B SO EZ - STILL WE DANCE" 36” x 48” My 85 year old Uncle Raymond and aunt Cookie have been cornerstones in my life ever since I was a child. They often shared stories of their youthful exuberance and fun filled dalliances. Married since 1950, Cookie says when she first laid eyes on him (as she was a waitress in a small country beer tavern and dance hall), she knew he would be the one. Their love knew no boundaries. Charles M. Williams was born and raised in the small country community of Hattonsville in Portsmouth, Virginia. The third of eight children, he lived in a shotgun house with six rooms and no indoor plumbing. He studied art at Pratt Institute in NY and received a BA in Fine Arts from Norfolk State College, and then a degree in education. 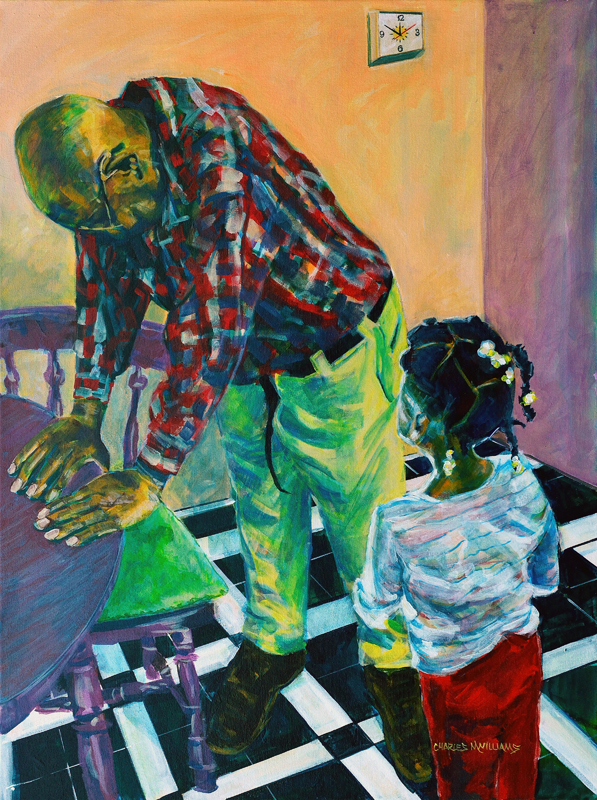 Mr. Williams became a high school teacher and then the Artist-in-Residence for the Norfolk Public School System. Thirty years later he retired from a Risk Manager position with Ford Motor Company. Through all of those years he continued to draw, paint and create. You can find his work at fineartamerica.com.